The Yankees have grabbed a suspended game from the jaws of defeat. Tuesday night, their series opener with the Nationals was suspended due to rain after the top of the sixth with the score tied 3-3. The game will resume at 5pm ET tomorrow, with the regularly scheduled series finale still set for 7pm ET. Here is the box score for the still ongoing game. Thanks mostly to Tyler Austin, the Yankees rallied to tie the game after falling behind 3-0 early. Austin smacked a two-run home run in the fourth inning and added a long game-tying sacrifice fly in the fifth inning. Had the Yankees still been trailing after the top of the sixth, it would’ve been an official game and a Nationals win rather than a suspended game. Masahiro Tanaka had a shaky start, allowing an Anthony Rendon solo homer in the first and two more runs in the second. He settled down and retired the final eleven batters he faced. Interestingly enough, Tanaka abandoned the windup and pitched exclusively from the stretch after the second inning. Hmmm. That suggests his mechanics were out of whack and he wanted to simplify things. Both teams had chances to tack on runs early in the game. The Yankees left runners on second and third bases in the first and second innings — they had men on second and third with no outs in the second and didn’t score — and came away with only one run after loading the bases with no outs in the fifth. 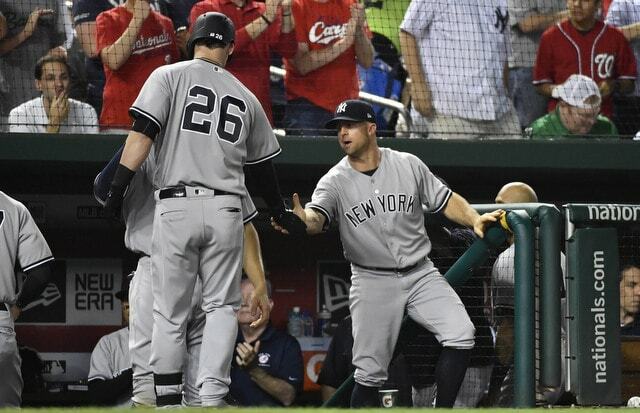 Gio Gonzalez put ten men on base in five innings and the Yankees scored only three runs. Annoying! Washington stranded a runner on third in the second. Wednesday’s weather forecast isn’t much better, and although both teams have an off-day Thursday, Aaron Boone said it is his understanding that day is not available for makeup games because the Yankees are leaving for Kansas City tomorrow night. I dunno. We’ll see. Also, both teams are allowed a 26th man for tomorrow night’s regularly scheduled game, though the 26th man won’t be eligible for the completion of this game. As best I can tell this is the Yankees’ first suspended game since Game One of the 2011 ALDS against the Tigers. Remember that? I’m convinced the Yankees lost the series because of the rain. It forced them to use CC Sabathia and Ivan Nova in Game One rather than Games One and Two. Oh well. I can’t find New York’s last regular season suspended game. I seem to remember one against the Royals when A-Rod was going for his 600th homer? Whatever. I assume both teams will go right to the bullpen rather than get cute with a starter or something when the game resumes tomorrow. When the game does resume, it’ll be the start of the bottom of the sixth, with Bryce Harper due to lead off. (Chasen Shreve had been warming before the rain.) The Yankees are due to bring Giancarlo Stanton, Gary Sanchez, and Didi Gregorius to the plate in the top of the seventh.